Digital Signage is available in various locations throughout The Spark to showcase your student projects or advertise your campus events. Our goal is to support the WSU community in offering creative and innovative ways to highlight academics and foster engagement. Content must be submitted at least one week prior to requested publish date and must adhere to all specifications. The creation of content for display is the responsibility of the group presenting the information to the campus community. 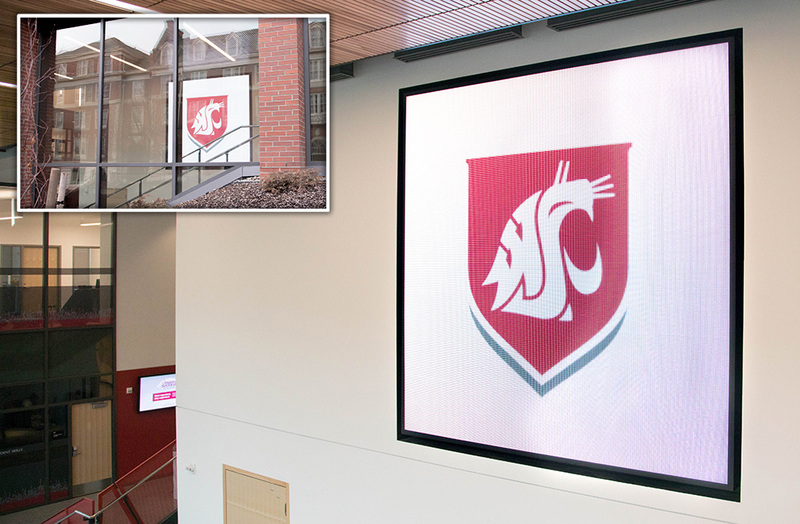 Digital signage may be rejected for content that does not meet the specifications or is deemed inappropriate or not relevant to the WSU community. Files are not archived and the requester must resubmit if additional run time is needed. Please see specific display descriptions below for additional information. 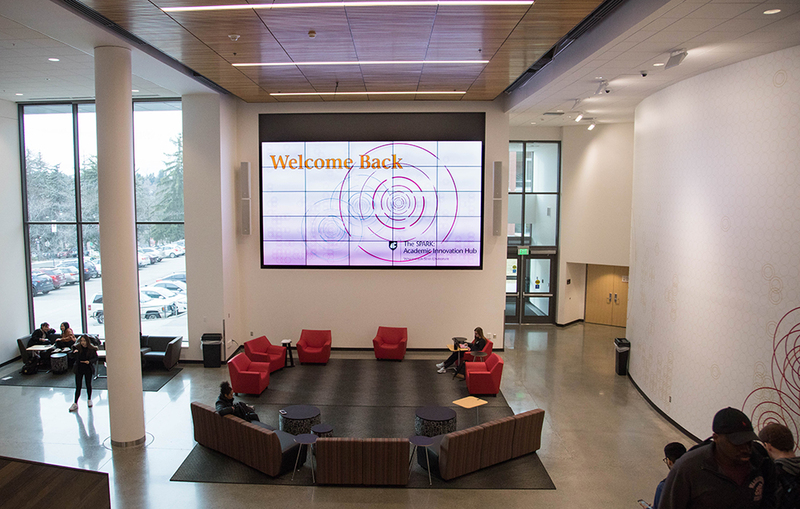 Digital signage requests in support of credit-bearing courses are available at no charge to students and faculty. Registered Student Organizations (RSOs) and departments will be charged a nominal fee for all digital signage. Outside vendor requests may be approved for events scheduled to take place in the facility or that directly support the WSU community. Questions? Please send an email to AMS@wsu.edu. Audio is not available for this display. All ads must maintain a 1:1 aspect ratio with a minimum of 800 x 800 pixels. Minimum resolution of 72 dpi and Maximum resolution of 96 dpi. Images must be saved as a jpg and will be played for 10 seconds per rotation. Videos must be formatted to 24 frames per second (fps), saved as AVI. Videos must be no more than 30 seconds. We recommend less than 20 seconds. 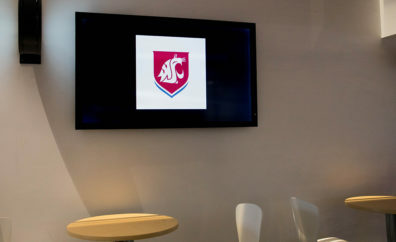 University departments should refer to brand.wsu.edu and follow required university identity and style guide standards. Registered Student Organizations (RSOs) have permission to use WSU spirit marks, but not the university logo. 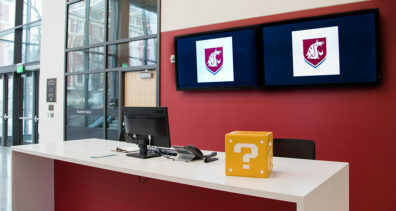 More information is available at brand.wsu.edu. Files must be no larger than 250MB. When designing promotional materials for the digital signage system, please keep clarity and aesthetics in mind by using easy-to-read fonts and clear photos. Make sure to include all pertinent information such as date, time, location of an event, and your departmental logo/name. Less content is better for digital signage, as viewers are typically on the move and there are many ads in rotation at any given time. Ads will not be run during scheduled events. All ads must maintain a 16:9 aspect ratio with a minimum of 1920 x 1080 pixels. We recommend 3840 x 2160. Images must be saved as a jpg and will be played for 15 seconds per rotation. Videos must be formatted to at least 24 frames per second (fps), H.265 codec and saved as .MP4 with no greater than 2 MB bitrate. Files must be no larger than 500 MB. High traffic area located next to Starbucks on the ground floor. The display is reserved for “What’s happening today” events scheduled in SPARK only. No fee if your event has an official reservation. No videos. All ads must be sized to 1920 x 1080 pixels. Minimum resolution of 150 dpi and Maximum resolution of 300 dpi. Accepted file types: jpg, avi. Accepted file types: jpg, mp4.